Weighing in half as heavy as the hippest of smartphones, the Graham Chronofighter Superlight Carbon Skeleton is a horological high-flyer. Adding less than 100g to the wearer’s personal baggage allowance, this watch means business – and leisure too. Graham has taken its Superlight carbon technology to new levels. The result is a timepiece that has a skeleton dial under its wing, as well as a case, buckle, bezel and iconic start and stop trigger in this innovative material. In functionality and durability terms, this chronograph is no lightweight. It’s powered by a Swiss G1747 automatic chronograph movement, integrating 48 hours of power reserve and protected by an Incabloc® shock absorber. Comfort on board was also a design priority, with the only remaining danger zone being a periodic tendency for the wearer to forget the watch is there. 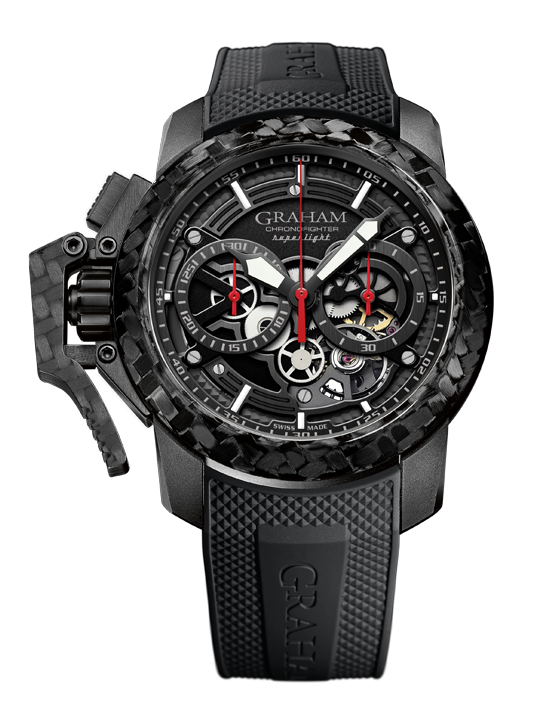 Airport security isn’t the only place the Graham Chronofighter Superlight Carbon Skeleton can be expected to fast-track. The Chronofighter Superlight Carbon complete watch; lighter than 100g.